Not every useful skill is readiliy visible. That is why the 15 Specialized Heavy Air Refuelling Course (SHARC) Course-0 and the 12 Course-1 graduates do not appear different, but they are! After two busy weeks and nearly 80 study hours, these students are the first ­NATO-trained Air-to-Air Refuelling (AAR) planners, ready to support the next Joint Air Force Component (JFAC) exercise or real-world event. Until now, NATO JFACs have relied upon USAF-trained AAR planners to meet the needs of this unique and complex challenge. The need for this training was made readily apparent during OPERATION UNIFIED PROTECTOR (OUP) in April 2011. At the start of the ­operation, the supporting JFACs were in desperate need of trained planners and the only ones available were from US Air Operations Centres (AOCs). Without their expertise, the daily Air Tasking Order (ATO) would have been excessively delayed and the Commander, JFAC’s objectives put at risk. Throughout the oper­ation NATO planners’ experience grew; however, the AAR planning puzzle remained a daily reminder of NATO’s need for this training. After the dust settled and the lessons were written down, the JAPCC conducted a critical look at AAR ­capability in NATO. In the 2014 ‘AAR Consolidation – An Update’, one of the recommendations is the introduction of a common training programme for AAR planning staff as a pre-employment requirement to assignment in a NATO Air Operations Centre. This objective looks at two issues, the first associated with OUP and second with the new NATO Command structure. When declaring JFAC Initial and Full Oper­ating Capability, the training gap issue was not ad­equately ­addressed even though it was one of the OUP Lessons Identified. What is not fully understood, perhaps, is why AAR planning is different from other JFAC planning positions. For those unfamiliar with AAR planning, it must overcome many compatibility restrictions, national limi­tations of receiver and tanker nations, and is made more complex because it is the last element of the daily plan to be coordinated. The technical compatibility restrictions limit which tanker can refuel a given receiver, or mandate a limited altitude or speed range. National limitations in place for multinational oper­ations apply to AAR, as one example, a nation may not agree to provide support to kinetic oper­ations, thereby restricting their tanker’s available receivers. Finally, the part most resembling a jigsaw puzzle is the time where AAR is added into the daily plan. As the last piece of daily plan, all receiver request times are in place and assigned to a geographic area. The AAR planner must fit their limited resources such that they meet the requirements of multiple ­receivers from ­different nations, applying the aforementioned restrictions in addition to doling the always limited fuel to meet the AAR need. A common problem during planning is a tanker has excess fuel after meeting some requirements, but there are no receivers within hundreds of miles to make use of it. This type of complex puzzle solving is not taught to tanker aircrew because it is not required for the execution of their mission as single aircraft or in formation. It is unique to operational level planning and, for the past 15 years, has been taught successfully in the US with a specific mix of lectures, practical exercises, and evaluations. The SHARC begins with the assumption the student knows what AAR is but may not be familiar with all the details. It also assumes the student has an idea of how a JFAC works but not necessarily where AAR fits in the cycle. The course builds on these foundations of know­ledge rather quickly in the first two days, in­undat­ing the student with timelines, definitions, NATO tanker and receiver capabilities, receiver missions, JFAC priorities, and interoperability concerns. Then, a sharp focus on the tankers themselves illuminates the concerns and constraints when basing heavy aircraft in an area of responsibility away from their home bases. Add a smattering of airspace design and operational case studies and the student is ready to attack the ‘Beautiful Mind Board’. The ‘Beautiful Mind Board’ is a reference to the 2001 film about American Nobel Laureate John Nash and scenes where he would write theories only he seemed to understand on a blackboard or his dormitory windows. The result of an ATO days’ worth of receiver ­requests and the solutions the planners devise creates a similarly confusing mass of information decipher­able only by the initiated. The largest challenge faced by the students is putting the knowledge from the first week into practice. The students are provided the same amount of time they would be allotted during a 24 hour ATO cycle to take the completed AAR requests and produce an exe­cutable schedule. The first iteration requires about 90 separate AAR requests be completed, with nearly 40 tankers at their disposal. Without any restrictions other than mechanical fitting, this allows the students to experience the process from start to finish. Most use slightly over half of the available tankers. Their ­second iteration increases the number of requests by 50 % while adding some restrictions preventing some receivers from refuelling from certain tankers. This brings the realism closer to real operations and stresses their use of the multi-capable assets. The third iteration increases the number of requests again, though only by 20 %, which brings the number to the approximate level of recent Alliance operations. The true challenge comes with the caveats and restrictions placed on multi-national AAR pairings. These are dramatically increased, to a realistic level. Finally, the tanker resources available are also reduced closer to the level they might see in a future operation. This last iteration also brings the negotiation between AAR planners and receiver planners into play, as not every request can be met as initially made and must be ­negotiated to ensure mission accomplishment or, in some cases, subject to prioritization. Each of these days creates an executable plan, which leads to the final skill these students will need. Executing a day’s AAR plan will, unfortunately, never be as simple as letting the schedule run without some active supervision. The dynamic nature of today’s oper­ations require a skilled tactician to understand all of the requirements placed on making the initial schedule, then to make changes to missions and ­anticipate the subsequent impacts. The students are given a series of dynamic changes which must be solved, during which they have access to a variety of tools. Again, time is a factor because many of these ­decisions, like others in the JFAC, must be made quickly and efficiently. After successfully ­hand­ling these execution challenges, the students have learned and practiced all of the skills they will need to work AAR planning and execution within the NATO JFAC staff. These trained individuals are a resource never before available to all of NATO. The training is designed so the graduates can integrate smoothly with US-trained individuals and vice-versa. The focus on the multi­national restrictions and the diversity of the force brought in an Alliance operation makes it unique and perfectly matched for the NATO AAR picture. The course is accredited by Allied Command Transformation as ‘NATO SELECTED’ and is designed to become required training for assignment to AAR-specific roles within the JFAC. This course meets NATO’s need. The nature of AAR ­requires individuals trained and familiar with the ways our tankers and receivers operate together and with all of the challenges faced when combining ­Alliance tanker resources into a coherent, executable plan. Our previous operations and exercises have shown the same take-away points: planning AAR on the oper­ational level requires unique training not provided to AAR aircrew. The SHARC brings the ­education and training necessary to face these challenges, addresses the Lessons Identified from OUP, and enables merging the awesome capabilities of the Alliance into a cohesive operation. commissioned through AFROTC at Rochester Institute of Technology in 2002. He is a senior pilot weapons officer with more than 2,900 hours flying KC-135R / T and T-1A aircraft. He has completed operational tours in Southwest Asia, Caribbean, and Afghanistan, most recently as operations officer for forward-deployed KC-135 aircraft. Major Chambers brings a breadth of experience in squadron operations, interoperability, exercise evaluation and execution, and tanker planning and operations management. 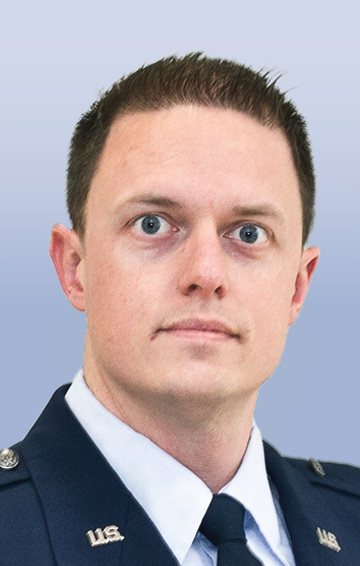 Major Chambers currently serves in the Air Operations Support branch at the Joint Air Power Competence Centre in Kalkar, Germany, where he develops NATO AAR doctrine and fosters interoperability and a unified AAR message for the Alliance.